One of the most common questions I get in the Pilates Studio is "My feet hurt...what can you do to help me?" First I want to understand more about their question of feet hurting. How is this person walking, standing, getting up out of chairs, what kind of work do they do, do they have an imbalance in the pelvis that is causing them to lean more into one leg or foot causing the foot pain. Foot pain generally starts in one of three places: The toes, forefoot, or the hind foot. The Toes: Most often toe problems occur because of ill-fitting shoes and this can be one of the reasons why my feet hurt. Common complaints in the toes are bunions, hammertoes, and neuromas. Includes the five long bones that extend from the front of the arch to the bones in each toe, and the two smaller sesamoid bones that connect to the big toe. Common complaints here are corns, calluses, and joint pain from arthritis or wearing improper fitted shoes. Why do my feet hurt in the back of the foot or heel? Pain here can extend from the heel, across the sole or arch to the ball of the foot. Common complaints in this area are heel spurs, fasciitis, and tendinitis. These can be caused by poor walking gait, improper stance, and doing this repetitively. So, as you consider “Why do my feet hurt?” Ask yourself how you are standing and then become more conscious of the proper placement of your feet as you stand walk and get up and down. 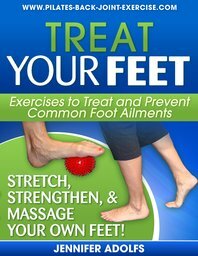 Get the new Foot Ebook for these and more great foot stretching and strengthening exercises. This creates awareness of correct weight distribution, helps with posture, alignment, and gait (how you walk). Throws off your body alignment, posture, gait, and balance. May cause lower back pain. This action is when your foot flattens and the weight collapses toward the midline of the body. Over time this causes an imbalance between the knee and hip, which can rotate the back causing chronic pain if not corrected. This is the rolling of the foot to the lateral side or toward the pinky toe and affects the ankle joint and up the entire body. Now consider proper weight distribution in your feet. To find your correct placement imagine the bottom of your foot as a triangle: Center your weight evenly across all five toes from the big toe to the pinky, then into the heel. Feel 60 percent of your weight forward of your ankle bone, gently gripping with your toes. 1. Women have more flexibility in the foot due to varied heel height throughout our lives. But, we also get more pain and ailments in the toes and Achilles tendonitis due to the high heels. 2. Men’s feet become more stiff and rigid due to stiff soled shoes and less movement in the foot over time. This leads to poor circulation, and maybe even neuropathies in these aging feet. 3. The soles of our feet lose padding = less shock absorption = why do my feet hurt. 4. Our arches drop causing flattening and foot pain. 5. Flexibility decreases, circulation weakens, and proprioception diminishes dramatically which equals a decrease in balance. – Especially good for flexibility in the foot and ankle and for awareness of proper weight placement in the foot. And…Helps to strengthen those “getter-upper” muscles, the four quadriceps in the top of the leg. Sitting on the front edge of a chair, line your feet up so they are spaced hip width apart and directly under your knees. Feel your weight equal from big toe to pinky toe and into your heel. Bring your weight forward and press straight up evenly through your feet as you stand up. When you sit put most of your weight back over your heels to slowly lower yourself. Note: Keep your knees and toes pointing straight forward. If you find your knees want to bow in or out place a small ball or pillow between them to keep your alignment and to strengthen the vastus medialis, or inner thigh muscles. HEEL LIFTS – This is a great foot strengthening exercise as it helps to strengthen the feet, ankles, and calves in the lower leg, while improving flexibility. Standing with weight placement equal from big toe to pinky toe and into the heel. Slowly and deliberately roll your weight forward through the middle of foot to ball of foot making sure the weight stays even (no rolling in or out), then continue up to toes as you lift your heel off the floor as high as you can stay balanced. Hold for a second at the top, and then slowly lower. Repeat 8-12 repetitions. - This is one of the single best exercises you can do to improve your balance! As we age the muscle on the top of the foot weakens and it causes us to shuffle our feet along as we walk. This weakness causes us to trip on cracks, rugs, or whatever else may be in our way because we are too weak to lift the foot over the object. We may end up stubbing our toe or twisting an ankle, or worse...falling and breaking something, which can be why my feet hurt. Sitting or standing with heels directly under knees. Tap your toes together or alternating to point of fatigue. You will feel the work on the top of your foot and into the shins. 50 -100 taps to the point of fatigue in the muscle. Leave "Why do my feet hurt?" and find more information on foot strengthening exercises here.